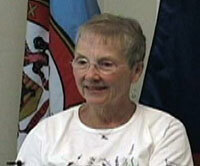 “Oral History: Eileen Garnett,” braddockheritage.org/, accessed April 24, 2019, http://braddockheritage.org/items/show/106. Eileen Garnett moved to Annandale in 1972. She reminisces about development that came to support increasing numbers of homes and subdivisions. She describes the revitalization project which she helped found in the 1980s and continues to guide. The revitalization project worked to upgrade the business district in Annandale.